There are dozens if not hundreds of monthly clubs for all sorts of products. These clubs are a lot of fun. I love looking forward every month to seeing what kind of present I’m going to get in the mail. It is a great way to try some brands or styles of your favorite things that you may not have on your own. You can find clubs for wine, cigars, toys, meat and so much more. Beer is no different. In the last few years we have seen a bunch of beer of the month clubs pop up as well. In this post I review one that I have really enjoyed so far and that is the Craft Beer Club. One thing that really has made this club stand out from the others is the shear number of great small breweries that have been featured so far. They do a great job searching for little-known, but fantastic breweries that may be known in their town, but not to the general public. I joined a few months ago and have tasted some amazing craft beers in that time that I had never heard of nor would I have ever had a chance to try because the great majority of these brews aren’t distributed any further than their immediate area. Craft brewing has really picked up in popularity in the last few years and is becoming serious business, just like wine-tasting already is. There are world-wide competitions held each year with more and more beers competing at each and every event. Competition is getting fierce with the pride of each brew master on the line. With all of these great beers, I’ve had a full beer cooler with tons of selection for my friends and family to enjoy. I’m someone who loves to try new beers all the time so this club is right up my alley. Thankfully, with new breweries popping up every month, the Craft Beer Club isn’t going to run out of craft beers to include for a very long time. I highly recommend giving this beer club of the month. If you are like me and love to try new beers, then you will definitely enjoy it. One tip I have is to “like” them on Facebook first. This will give you a code to get $5.00 off your first order. 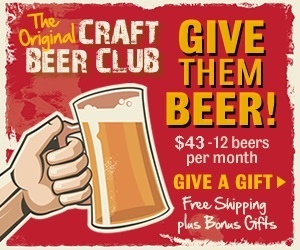 Click here for more information about the Craft Beer club.